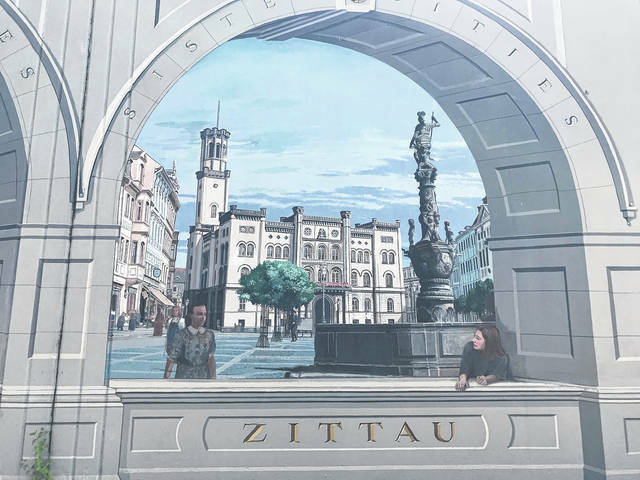 Zittau, Mexico is one of three Portsmouth Sister Cities memorialized on the city flood walls. Because of an inactive relationship with the other two, the Portsmouth Sisiter City organization is seeking a new relationship with a town in Ireland. Portsmouth Sister City organization President Karen Davis presides over Thursday’s annual meeting of the Sister City group. Among those looking on was Portsmouth City Councilman Sean Dunne, seated in the front row to Davis’ right. Later this month, the Portsmouth Sister City Organization is hosting Thomas Zenker, the Lord Mayor of Zittau, Germany, one of Portsmouth’s three sister cities, which include Orizaba, Vera Cruz, Mexico and Corby, England. All three sister cities are somewhat immortalized on the city’s flood wall murals. And although the relationship with Zittau seems to remain intact, contact with the other cities has fallen off or is essentially nonexistent. At Thursday’s annual Sister City dinner, it was jokingly suggested Portsmouth “divorce” at least one of its sister cities. With all that in mind, at the Thursday meeting, the group with about 45 paid members voted to pursue a new relationship with a city, as yet to be determined, in Ireland. 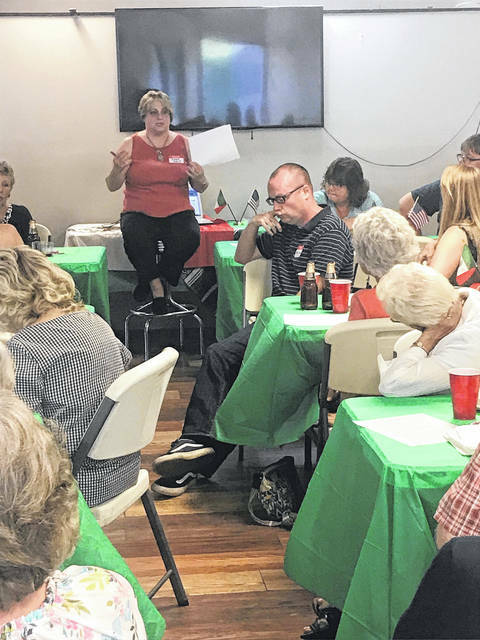 Organization President Karen Davis said the group is focusing on Ireland because of a strong Irish and Celtic presence in the area to include an active and good-sized local Celtic Club that organizes the annual St. Patrick’s Day Parade and seemed to be well represented at the Sister City’s dinner. Although he is apparently not a formal member of the Sister City Organization, Portsmouth City Councilman Sean Dunne presented several Irish cities to the group for consideration. He seemed especially keen on the city of Thurles, a river city apparently of about the same population as Portsmouth in County Tipperary, Republic of Ireland. At the suggestion of member Jean Carlson, those gathered instead began to take a liking to another Irish river city by the name of Ennis, also located in the Republic of Ireland. Ennis is the county town of County Clare, Ireland. The Irish name is short for Inis Cluana Rámhfhada. The town is on the River Fergus, north of where it enters the Shannon Estuary, 19 kilometers from Shannon Airport, according to Wikipedia. “I didn’t think of Ennis, but it’s a good idea too,” Dunne said. Davis said there are a couple of ways for Portsmouth to acquire a new sister city. One is to look at the sister city international site and search for cities looking for partners. “It’s kind of like a dating site,” Davis quipped. “We can put (our) name out there and see what happens,” Davis agreed. In the end, the group members gathered voted unanimously to one, seek a new sister city, and two, to seek out a city in Ireland. “All right, I’m excited,” Davis said regarding the votes. She did not say how long it might take for Portsmouth to set up a relationship with a new city. Following the meeting, Davis talked about how the organization and its sister cities were a lot more active in the past. There were regular exchanges of visitors, especially students, between the cities. The Portsmouth organization helped support an orphanage in Mexico and provided Orizaba with an ambulance. “We hope really to have more to offer than just youth exchanges,” Davis continued. She added Portsmouth attempts to keep contact with its sister cities, but neither Corby nor Orizaba have active sister city organizations. In the meantime, the visit of Zittau’s Lord Mayor Zenker is being organized on behalf of the U.S. Department of State’s International Visitor Leadership Program, World Affairs Council, which for this area is headquartered in Cincinnati. According to the World Affairs Council’s James McManus, during his visit, Zenker will be meeting with the Scioto Foundation, Scioto County Economic Development Director Robert Horton and some members of Portsmouth city government, although it’s not clear who will be representing the city. McManus said in a letter to the city Zenker also expressed interest in meeting with city safety forces. One other activity of the Sister Cities Organization was highlighted Thursday. The group gave a round of applause to the organization’s two-time college scholarship winner, Wheelersburg High School graduate Nate Marcom. Marcom, 18, will be a sophomore next year at Shawnee State University majoring in political science with a focus on international relations. He hopes to enter the U.S. Foreign Service upon graduation. As the Thursday night gathering represented the Sister City group’s organizational meeting, members added two new board members, Harold Massie and Gary Albrecht. Davis was reelected president. 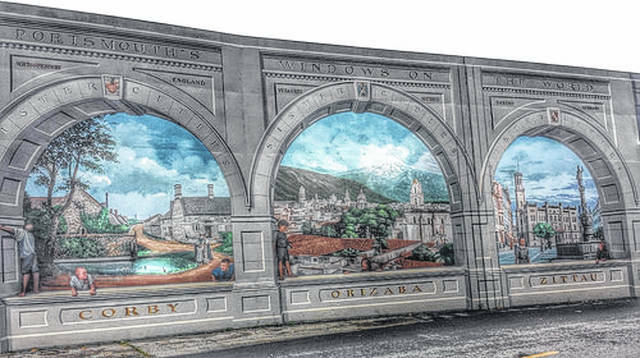 https://www.portsmouth-dailytimes.com/wp-content/uploads/sites/28/2018/06/web1_zittau-A.jpgZittau, Mexico is one of three Portsmouth Sister Cities memorialized on the city flood walls. Because of an inactive relationship with the other two, the Portsmouth Sisiter City organization is seeking a new relationship with a town in Ireland. https://www.portsmouth-dailytimes.com/wp-content/uploads/sites/28/2018/06/web1_sister-meeting-A.jpgPortsmouth Sister City organization President Karen Davis presides over Thursday’s annual meeting of the Sister City group. Among those looking on was Portsmouth City Councilman Sean Dunne, seated in the front row to Davis’ right.